An Unsolicited Proposal Program winning exhibition. Learn more about the Unsolicited Proposal Program. Eyal Weizman and Laura Kurgan in conversation, moderated by Mark Wasiuta. 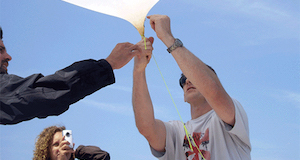 Make a community satellite using a helium balloon and inexpensive digital cameras. Since the invention of aerial photography during the last decades of the 19th century, the sky above our heads has become a territory subjected to militarized conflicts over mastery and command. Following this evolution, the view from above has become associated with state control and corporate power. This reality is even more apparent in recent years with the excessive worldwide use of drones and other Unmanned Aerial Vehicles (UAV) for purposes of surveillance and destruction. Parallel to this disturbing rising trend, and in many respects as a response to it, an increasing number of artists, activists, scientists, and designers from different regions seek ways to use today’s technology to re- appropriate the sky and reclaim the view from above. These efforts and experiments stand at the center of Decolonized Skies, an exhibition that brings together artists and groups of practitioners from a variety of disciplines. They attempt to decolonize the aerial point of view and the visuality it produces by manipulating satellite images, operating hand-made UAVs, and creating new mapping systems in a search for civilian-oriented visual and political imagery. The exhibition explores the new visual strategies generated by the democratization of the view from above for the production and distribution of civilian knowledge. It underscores the empowering potential of civilian action while questioning the very notion of “democratization.” The assemblage of videos, maps, computer programs, sound bites, and images offers alternative strategies for engaging with and obtaining information about local socio-political hotspots. By presenting these very different projects in one exhibition, we hope to highlight two important aspects of the artistic engagement with the demilitarization of the aerial point of view. Firstly, we wish to frame the current discourse on the topic within its historical context and begin to delineate a genealogy for this process. Secondly, we wish to formulate the practice of decolonization as a collaborative act between practitioners from different fields. As in other struggles for reclaiming spaces that belong to the public, the strategy of cooperation reveals itself as fundamental. Hence, all the exhibited projects both contribute to the re-appropriation of the view from above and explore new modes of cooperation, sharing, and exchange. An early historical use of aerial photography can be found in the canonical image San Francisco earthquake ruins by George R. Lawrence. Lawrence took the photo days after San Francisco was devastated by an earthquake on April 18, 1906. Although he wasn’t the first to employ aerial photography for non-militarized use, San Francisco earthquake ruins demonstrated the potential such a viewpoint has to provide local and practical information that may serve a community in a time of crisis. 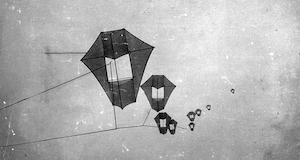 The series of photos, which also includes two photos of Lawrence’s camera (or “Captive Airship” as he called it), underlines the technologically innovative aspect of his work, a theme shared by all the projects in this exhibition. Peter Fend, one of the founders of the Ocean Earth Development Corporation—a research-based, collaborative think tank of artists, architects, and scientists—was the first artist to use satellite imagery as a powerful tool for information production. In the early 1980s, Fend and Ocean Earth purchased civilian satellite imagery from EROS (Earth Resources Observation and Science)—a governmental entity that is also a commercial outlet—in order to monitor and analyze global ecological and geopolitical crisis zones. Intending to provide analysis that was neither politically manipulated nor censored, they sold the story these images contained, such as the ongoing danger of radioactive leakage in Chernobyl, to major media corporations. In addition, they created their own independent cable TV programs and exhibited their research in artistic contexts. Exploring the link between art and information, with special attention to the role of abstraction in understanding raw data, Fend created a series of collages that bring together satellite images, drawings, photos, documents, and text. These collages, all concerned with damaged environments, not only represent Ocean Earth’s analysis of a specific geopolitical situation, but also provide a glimpse into the politics behind the process of developing these projects and displaying them. Adopting a different strategy for questioning the accessibility and visibility of information, artists Bik Van der Pol collaborated with Google for Elements of Composition (As Above, So Below). Their project is composed of several layers: the first takes place on the ground in the form of a written text piece and a series of guided tours led by locals who share their knowledge of the area’s history. The second layer takes place above ground level and is composed of two images, a publication, and a sound piece based on the tours. One of the images was taken from a commercial satellite while the other is Google Earth’s manipulated image of the same site. By juxtaposing the two images, the artists reflect on notions of truth, resolution, and reliability in relation to satellite imagery and suggest that this “objective” image is often a manipulated image in disguise. 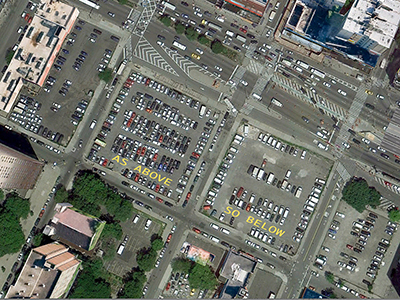 Moreover, the play between the different layers allows for speculation into the future of the open sky above the text piece and questions the future vertical development of the neighborhood. Also working with Google’s Geographic Information Systems (GIS), artists Effi and Amir’s The Vanishing Vanishing-Point is a poetic film-essay documenting their relationship with an olive tree planted in the garden of the European Parliament in Brussels. Exploring the process of filmmaking within the existing visual language of mapping systems like Google Street View and Google Earth, the artists investigate questions of perception and representation, authorship and appropriation, as well as the time/space correlation. Their insistence of focusing on the personal provides new insight into the alienating nature of the view from above, while the specific location of the tree and its particular history situate their artistic and philosophical quest within a larger socio-political context. Graphic designer and artist Ruben Pater’s Drone Survival Guide is an urgent response to the growing use of militarized drones for surveillance and attack. The guide, presented as a poster, features silhouettes of the types of drones commonly used today, indicating their country of origin and whether they are used for surveillance or deadly attack. Like in any bird guide, the drones are represented in scale, from the smallest consumer drones (less than one meter long) to the military Global Hawk (almost 40 meters long). The other side of the poster lists tactics for hiding from drones and interfering with their sensors. The artist encourages people across the world to translate the guide, making it available for home printing in many languages. The guide is printed on reflective material, which can use sunlight to blind a drone’s camera—making the poster itself a useful object for interfering with a drone’s surveillance capabilities. By launching the project as a civil initiative, with no governmental or commercial funding, the artist aims to raise awareness of the roles drones play in today’s global reality as well as to reflect, both literally and metaphorically, on the roles played by citizens themselves in the process of technological change. 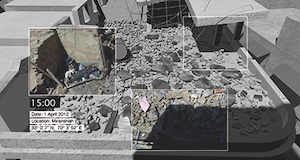 In Drone Strikes, Forensic Architecture—a multidisciplinary group of architects, artists, and filmmakers—gather, analyze, and present architectural evidence of drone strikes in war zones. Their investigation centers on the territorial, urban, and architectural dimensions of drone strikes, examining them on two different scales: on the broad, regional scale they study the spatial and temporal patterns of drone warfare, while on the local scale they provide a detailed examination of several specific strikes in Pakistan, Gaza, and Yemen. The goal of the project is to explore the potential connection between these spatial patterns and the number of casualties, especially civilian casualties. The Drone Strikes case studies presented in Decolonized Skies consist of maps, models, and animated data imagery based on the perspectives of survivors and on-site witnesses, as well individuals who visited in the aftermath of the strikes. In each case, they cross-reference the different types of available data, including satellite imagery, local and international media reports, witness statements, and on-the- ground images. By using a different methodology in each case study and demonstrating how these innovative tools of analysis may be implemented even when confronted with limited information and research materials, the project provides evidence for the use of international prosecution teams, political organizations, NGOs, and the United Nations. With this exhibition, we call for an understanding of the view from above as a site where ethics, politics, and aesthetics intertwine. Whether through advanced technologies or DIY methods, this yet-to-be-free territory is where proximity and citizenship, abstraction and responsibility are juxtaposed, opening up possibilities for new visual strategies—strategies that can expand our political imagination and allow us, finally, to decolonize the sky. High&Low Bureau is a curatorial duo composed of Yael Messer and Gilad Reich. Based in Amsterdam and Tel-Aviv, they curate exhibitions, film programs, performative events, and publications. The Bureau’s practice is dedicated to the exploration of artistic strategies that reflect on, and suggest alternatives to, specific social-political conditions. Recent projects: Our Work is Never Over, Matadero Art Center, Madrid (2012); Time/Resistance, The Israeli Center for Digital Art (2013); and Am I Not a Citizen? Barbarism, Civic Awakening and the City (The 13th Istanbul Biennial Film Program, 2013). The duo is the recipient of the Mondriaan Fonds Cultural Mediator subsidy (2013) and was invited to curatorial residencies in art centers such as Bar Barcelona (2013), CCA Warsaw (2013), and Para-Site Hong Kong (2014). Gilad Reich is a writer, curator, and a PhD candidate in the Gender Studies department at Ben Gurion University, Israel. His main field of research is representations of gender in post-Fordist societies. He has published numerous articles as well as exhibition texts and essays.